Q: Why are weeds such a major problem in this scheme now? Surely someone would’ve considered that weeds would come in time; was weed-block fabric not employed at all? Weeds and unplanned grasses are literally choking out some of the succulents in their beds … and others are now rivaling in height the palo verde trees. As they get bigger and take over entire areas, can the weeds ever be controlled? Q: Was there no plan put in place for ongoing maintenance of the HQ’s landscaping? Beginning months ago I began to be driven insane by the sight of weeds choking out the flowering aloes in their raised beds … then the wispy grasses edging the sidewalk began to overtake the sidewalk … then the flat areas and paths of decomposed granite began sprouting weeds of every stripe … and here we are today … and no one seems to be addressing it! in fact, I’ve never seen anyone working on the grounds … Even the most low-maintenance of landscapes need some tending, I can’t figure out what gives here. Q: Who do I talk to about this problem? I plan to forward this post to someone in the LAPD HQ’s administration, so I’ll keep you posted on any response I receive. 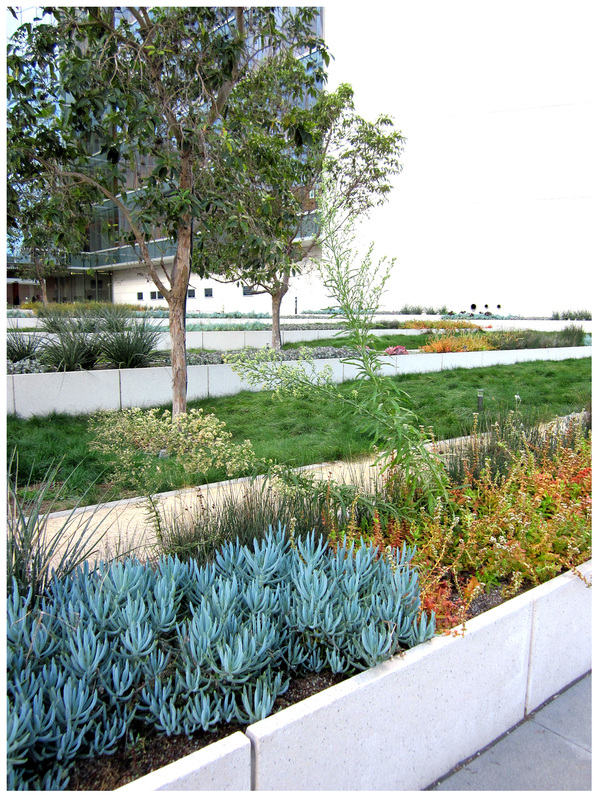 I hate seeing this integral part of a striking bit of LA architecture allowed to literally go to seed like this. I can’t be the only person who cares about this, right? Those photos are insane! I’m sure there will be an excuse about lack of money but really…surely someone could have organized some sort of work party before it got this bad, and at Police headquarters no less? If there had been graffiti on the hardscape would that have gotten their attention? they are so busted! you are such a vigilante gardener! sometimes you just have to take the shovel into your own hands. Busted, indeed! I emailed the LAPD today, I hope I get a response. How awful. Maybe the over zealous rains of December is the partial culprit ? Still, there’s no excuse for a landscape like this to be installed without a plan for the weed issue. Jeesh. I remember seeing a video of some younger kids (middle school / high school) that were into the whole guerrilla gardening thing…sorta edge for a teen. They would go around and either plant or weed out patches. Funny thing again was that it is illegal..at least where they are located. Time to get that crew and do a late night weeding session at strip. On a more serious note…Yeah, I suspect that it is all due to lack of budget. I suspect that if they were to stay ontop of their weeding for one year that the bed would probably stay pretty good and only need a hit quarterly. At this point bands of teen guerilla weeders would be welcome, though not likely. And, I’m not sure those forced into community service would take the gig very sensitively, and the succulents would be destroyed … someone, somewhere, is really not on their game in a very high-profile way, as far as the PD landscaping is concerned … I suppose I shouldn’t be entirely surprised: soon after the building was inaugurated the PD had a huge party on the city-block sized lawn on one side of the property, complete with monstrous tent; the set-up took weeks it seemed … and this, in effect, killed the grass … it took them months to address that problem finally, too. The lawn’s back now, but still. The Downtown Los Angeles Neighborhood Council (DLANC) has been organizing monthly community clean-ups of the LAPD HQ since last Fall. We get out with our neighbors to prune, weed and trim the first Saturday of every month at 10AM. With just a little bit of volunteer time we’ve managed to get the weeds and grasses along the street edge under control. DLANC is also working towards long-term solutions for the maintenance considerations beyond volunteer scope. See http://www.dlanc.com for more details on future efforts. Would love to have you and friends join at our next one! Thanks for your comment! Your work has been noted and the LAPD’s presentation is much improved … though I find it truly amazing that it’s through volunteer efforts the work is being done. Wasn’t the ongoing maintenance of the HQ’s landscaping a consideration? You just might see me one Saturday morning, although it’s not easy. I live in Riverside and commute via Metrolink, as I don’t drive.